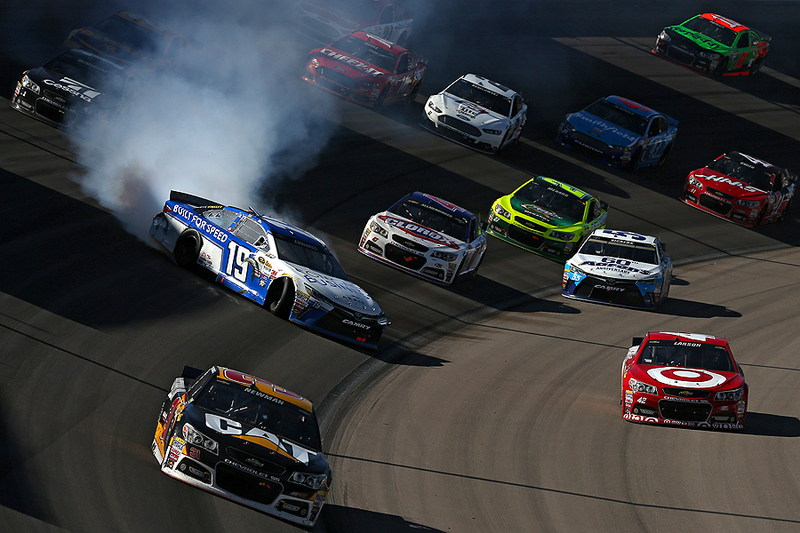 "Carl Edwards, driver of the #19 Comcast Business Toyota, is involved in an incident on the track during the NASCAR Sprint Cup Series Kobalt 400 at Las Vegas Motor Speedway on March 8, 2015 in Las Vegas, Nevada." Did you get it? That's often the question asked after any on track incident during motorsports. In all fairness, it's a good question. With more than 40 cars speeding by at over 150mph, for more than 200 laps, it's easy to feel like every passing is the same - but they're not. Each lap means that every time the drivers pilot by your perch, something storytelling could happen. Whether it's a pass, lead change, crash, or something completely different than the two. As soon as the green flag waves, the adrenaline is flowing. Once the race gets going, that dissipates naturally, meaning one must focus even harder. Some tracks boast three and four cars wide the entire time - while others produce single car action. Getting creative, while shooting telling images, can be a challenge at any track which makes motorsports fun. Wanting to combine the two aforementioned elements with really nice light patterns across the track, I worked hard at making sure I was alert and ready. This one small incident could have completely changed the outcome of the race and without being ready and in the correct spot, would have been missed.